Released by Ravenous Games, League of Evil is an action platformer game with hundreds of levels of jumping, wall climbing, and punching robot heads off! Available on the iPhone, iPod touch, and iPad, you can get this app for $1.99 or try out its Lite version for free. Ravenous Games also created Cave Run. So the League of Evil is a platforming challenge style game. Each level only lasts for about 5-6 seconds and the goal is to beat each stage as fast as possible without dying. Stage obstacles like the standard pit-spikes of instant death, cubes of spikey death, and soldiers with guns of death are strewn about and you have to punch and jump all over to get to the scientist at the end of each level. Punch the scientist and his head goes flying to cap off the level and you are ready to move on to the next stage. 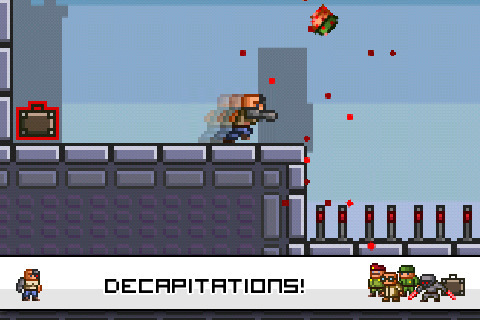 Yes, decapitation is common in League of Evil, I don’t even think it’s possible to just punch an enemy, one flying kick or dash punch will knock their heads right off. It’s kind of awesome. Pixel Art is everywhere so I won’t mention it anymore. Nostalgia bombs only have so much mileage. I can say, however, that the art in League of Evil is just plain excellent. Animations of your character are smooth and fun to look at while enemy designs are cute. My favorite is the little ninjas that try to kill you with their double swords. Stages consist of different parts of the world and in different cities. Architecture, mountains, and other elements in the background are very well done pixel art with lots of personality. Foreground elements like the floors and walls have a great look to them. Travel through multiple stages with dozens of different blocks with nice designs and colors to match the background. The controls aren’t too notable. They work, and that is the bare minimum requirement for all apps, so good job but I won’t say they are the ‘tightest controls’ I’ve ever seen. After playing games that give me full control over the position, scale, and transparency, you can get more comfortable controls. Trust me on that. The levels difficulty range from extremely simple tutorial type stages to immensely difficult ones. The game is nice enough to separate the difficulty levels into 3 worlds. Funny note, the last world actually pops up a notification warning about the difficulty of these levels. Good way to prevent people from complaining about how utterly frustrating these levels are to beat. So the final conclusion I can come to is that League of Evil is actually one of the better platformers I’ve come across. It’s no Super Mario Bros, but on its own, it’s excellent. Very well done graphics with really nice animation, challenging and addictive gameplay, and really entertaining themes of Megaman-style wall jumps with super punches. League of Evil is a game you should try for yourself and experience. 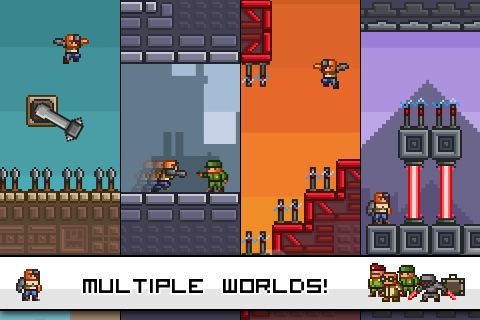 Sample the free version of League of Evil on your iPhone. AppSafari review of League of Evil was written by Joseph Ho on March 17th, 2011 and categorized under App Store, Featured, Fun, Games, Platformer, Time Management. Page viewed 4706 times, 1 so far today. Need help on using these apps? Please read the Help Page.